IBM Q System One… the world’s first integrated universal approximate quantum computing system! Oooh, I want one! How hard could it be to build my own? This will not be easy. 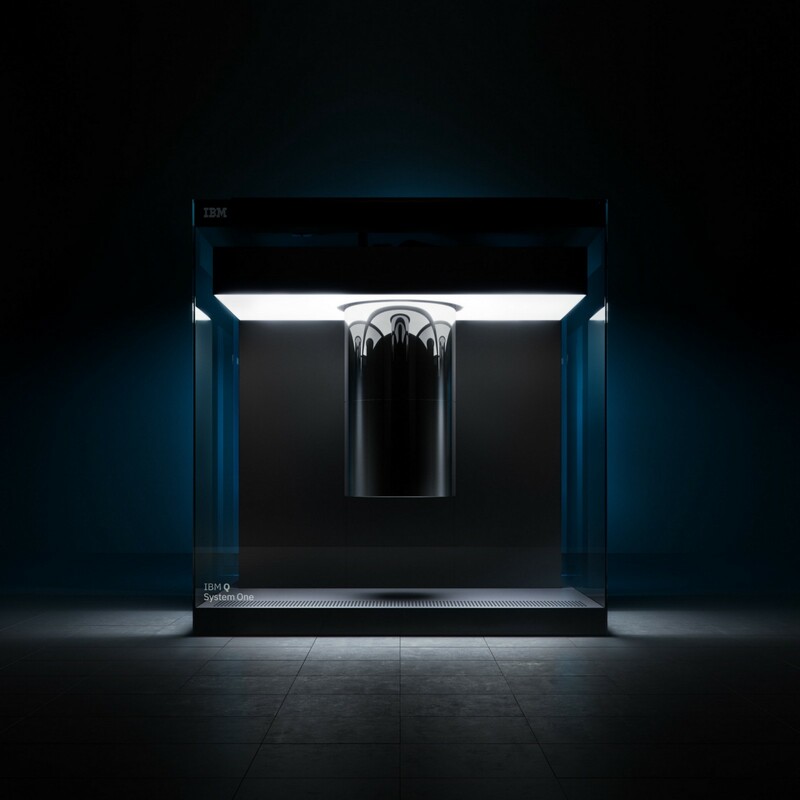 IBM Q System One is, after all, a cloud-based quantum computing offering, with the main hardware, cryostats, quantum chips and all locked away in the IBM labs. Let’s see now, what do I need? – Hey, I have a Raspberry PI lying around with nothing to do. Millions of lines of code to control my experiments, tweak the sensitive qubits, and return the results of my experiments. – Ah, it turns out that Qiskit , an open source framework for programming quantum computers, runs on Python, native to the Raspberry PI. Gorgeous nine feet cube of half inch thick borosilicate glass by Goppion, Milan. – Well, perhaps a nice plastic/bamboo Zebra Case by C4Labs will do instead? – An 8×8 pixel LED display on my SenseHat will do! Let’s call this contraption Qrasp (Quantum RASPberry PI)! You can hack your way through building your own Qrasp without any further knowledge of quantum computing, qubits or Qiskit (I’ve made my Qrasp source available on GitHub), but the real feeling of wow sets in when you understand what you have in your hands. Read until the end for a couple of quick starting points on quantum computing and Qiskit. After playing with Qiskit for a while, figuring out how to build my own quantum programs and create snazzy visualizations of my quantum results on my laptop, I was itching for something more “tangible”. I wanted a quantum computer that is self-contained, battery powered, flashes and dazzles, that could rest on a desk and that requires no logging in and input beyond some push buttons to start and stop things? It should be able to show simple superposition (two and three qubits) and entanglement (Bell and GHZ states), but also be flexible enough to swap in and out various quantum programs as “plugins”. It should be able to run quantum programs on a simulator back end as well as on a real IBM Quantum device. Rummaging through my existing hardware kitchen-midden I found an excellent volunteer for a little hack; a Raspberry PI with a SenseHat add-on and a USB battery pack to make it mobile. Luckily, the Raspberry PI runs Python 3.5 out of the box, and as Qiskit is Python-based we have a good match from the get go. The Qrasp software now lets you select to run your quantum programs on a local Aer simulator or on actual IBM Q hardware. To switch between the execution options, just press the joystick to display the name of the backend and set the execution mode. Important: To run against the IBM Q hardware you must first configure your Qrasp environment with an API key. For info, see the Qrasp README on GitHub. This script loads the required libraries and quantum program scripts, and uses the SenseHat joystick to select one of the Quantum programs. 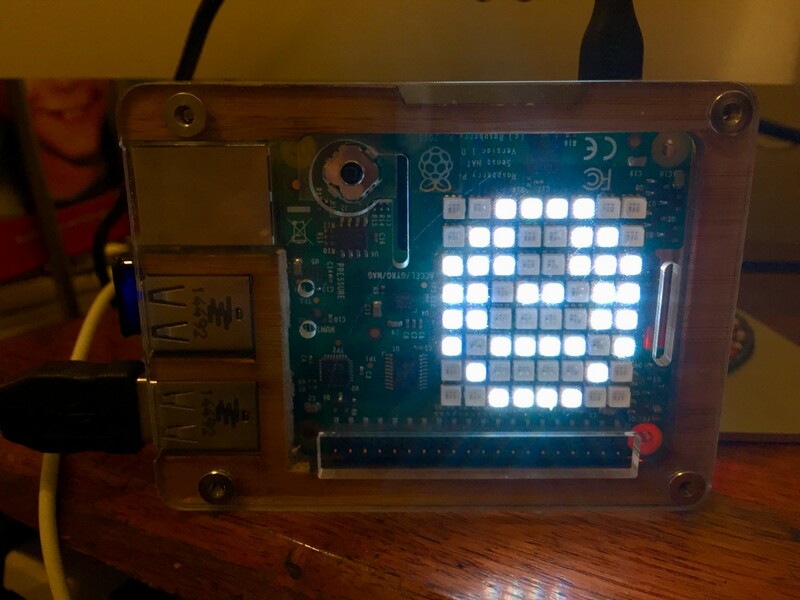 The display script uses the SenseHat 8×8 LED display to show a bar graph of 2 or 3 qubit Qiskit results dictionaries. A configuration file for storing your IBM Q Experience API key. These Qiskit scripts creates and executes quantum programs that run on a local quantum simulator, and then calls the display script with the results. Now, in your implementation, there is nothing stopping you from jumping in and modifying the Python code for these functions as you please. To get familiar with coding in Qiskit, why not go through some Qiskit Terra tutorials, or why not start exploring with some guided exercises for developers. Python function that creates a simple, two qubit quantum circuit and sets up and measures each qubit in a superposition state. Python function that creates a simple, three qubit quantum circuit and sets up and measures each qubit in a superposition state. Python function that creates a simple, two qubit quantum circuit and sets up and measures a Bell, or entangled, state. Python function that creates a simple, three qubit quantum circuit and sets up and measures an entangled GHZ state. In this program we initialize two independent qubits into the ground state |0 ⟩, and then apply a Hadamard gate to each of them, which effectively puts each qubit into a superposition of |0 ⟩ and |1 ⟩. We then measure the qubits and Qrasp creates a four column bar diagram that shows that the four possible outcomes have roughly equal probability (~25%). In this program we expand the quantum circuit by adding a third qubit in its ground state, and then applying the Hadamard gate. With three qubits, the generated bar diagram shows that the eight possible outcomes still have roughly the same probability (~12.5%). Now things get interesting. Again we initialize two qubits into their ground state, but the gates applied differ. In this case, we apply the Hadamard gate to only one of the qubits, directly followed by a so called controlled-NOT gate that “maps” the state of the superpositioned qubit onto the other qubit in a maneuver that is called entanglement. The end result is surprising, no matter which result we measure for the first qubit, the second qubit reads the same. Instead of seeing four different outcomes with roughly equal probability Qrasp displays two outcomes (both qubits in ground state, or both in excited state, |00⟩ or |11⟩) with equal probability (~50%). This counter intuitive outcome is called a Bell state, is one of the foundations of quantum computing, and was recently the subject of an excellent PBS Nova episode. To make a long story short, we are now doing the same for three qubits, with an end result of, again, two outcomes. Either all qubits in ground state, or all in excited state. With this GHZ state |000⟩ and |111⟩ display with roughly equal (~50%) probability. Push: Set the backend: AER ‘qasm_simulator’ or IBMQ ‘ibmqx2’ (actual hardware configurable in main_controller.py). Qrasp in Aer simulator mode. I wanted the Qrasp to directly display the returned quantum results with no need for an external monitor. Given that the SenseHat 8×8 LED display is somewhat limited for text and graphics, the only viable option would be bar graphs. For this initial demo this set a limit to the number of qubits in my quantum circuits to three or less to require a maximum of eight bars for the probability plot. |000⟩, |001⟩, |010⟩, |011⟩, |100⟩, |101⟩, |110⟩, |111⟩. Thus I need exactly eight columns to display all possible states of a three cubit quantum circuit. The two qubit results are displayed in just 4 columns (2²), so uses just half the screen. With all the pieces together, this is how Qrasp runs. After the initial, very colorful SenseHat boot sequence, the Qrasp main controller launches automatically and displays the messages “Qiskit ” and then the super-positioned 0/1 icon signaling that it is ready to go. Moving the joystick up displays the “2Q” message, indicating a superposition of two qubits and then launches the q2_calling_sense_func.py script which performs the necessary quantum calculations and then calls the display script to display the four column bar graph results of a two qubit superposition. Now move the joystick in the other directions, and see the other quantum programs execute! Then press the joystick button to take the actual IBM Q hardware for a spin. Take a look at the IBM Q Experience beginner’s guide. Getting started with Qiskit by Doug McClure, Qiskitter at IBM. Start exploring Qiskit coding with some guided exercises for developers by James Weaver (JavaFXpert). A community to discuss Qiskit, programming quantum computers, and anything else related to quantum computing.